The pace of improvement is very impressive and was helped by the smooth transfer of the estate and the efficiency and vision of the creation and operation of Trust. Setting up such an operation whilst ensuring the full involvement of tenants could be a much lengthier process but the Byker Community Trust is a model of rapid and effective change. The Grade II* listing of the Byker estate has helped make the decisions on improvements more focussed and precise, and the pragmatic approach taken by Historic England, the city council and the Byker Community Trust is a good model for similar areas where listing may appear to be a constraint rather than a benefit. The rationalisation of some of the original housing types where they do not meet local needs or had design constraints, has ensured that all the assets are used to their maximum effect. The rapid regeneration of the estate to meet contemporary needs, whilst fully involving tenants in its management, has created a great place to live for a very socially, culturally and demographically diverse community, which has resulted in a strong and trusting relationship between the tenants and community trust. The exemplary regeneration by BCT has been led by the improvement of social and housing conditions rather than starting with the more straightforward environmental improvements that would have provided some quick but superficial wins. This is a good example of estate management that deals with the harder issues first. The word iconic is overused, but it is fully justified for the Byker estate, which is probably the most famous and radical British public housing development of the late 20th century. Designed by Swedish-based architect Ralph Erskine and his partners, it replaced traditional Newcastle terraced housing with a unique design more familiar in Sweden than in Britain. Famous for it understanding of the local topography, the Byker Wall, its primary colour scheme and its inventive use of cheap, attractive materials; Byker was a site of pilgrimage for architects and planners. However, by the 1990s the condition of the place had deteriorated and Byker had become an unsustainable estate for Newcastle City Council. Although Grade II* listed in 2007, Byker was in need of regenerating physically, environmentally and socially. Due to its regional and national significance and the need to tackle its growing problems, a regional task force was established to explore a sustainable future for the estate. In July 2012, the Byker Community Trust (BCT) was formed following a successful ballot of Byker residents and a stock transfer took place, without any outstanding debt commitments, from Newcastle City Council. BCT set out to secure the much-needed investment to upgrade the estate; involve residents in greater direction of services on the estate and to ensure service reviews led to improvements in the delivery of services to tenants. BCT now owns and manages the land as well as over 1,800 homes and buildings on the estate, and the continued need for good quality affordable housing remains a priority. A board comprised of individuals with the necessary management skills and local residents is responsible for ensuring strong control and supports a highly skilled management team. BCT has invested £28.5m in improvements on the estate to date, delivering their stock transfer promises and using money borrowed from the Yorkshire Building Society plus rent income. Byker is a work in progress but BCT has made amazing progress in only four years, turning around a rundown, no-go estate into a residential neighbourhood that reflects Ralph Erskine’s original social and design concept and is widely valued by residents. BCT has delivered a £9.7m refurbishment programme to 628 flats and maisonettes in the Byker Wall, including link blocks. A full external fabric overhaul has included the installation of a new roof and photovoltaics on the famous Byker Wall; new windows and doors; improvements to communal stairwells and entrances; a new digital aerial system, removal of 300 tons of asbestos; upgraded door entry and CCTV system and repainting in line with the original colour scheme. Other major investment has been carried out on the district heating system, and seen the conversion of empty buildings blighting the estate into much needed homes for rent and homes for Veterans. How did such a lauded architectural and social project become such an embodiment of decline and community disintegration? It could be argued that the past failures of the estate were in some part a consequence of its Scandinavian design being unsuited to British living culture but this is being subsequently disproved by the ongoing success of the estate’s rejuvenation. A greater probability for the decline would be a combination of inadequate maintenance of buildings and common parts, created by the council’s inability to provide the capital investment necessary for overhauling systems and the building fabric. The demoralising effect this has on residents, increasing perceptions of disempowerment and neglect, would no doubt have contributed to community decline. It is easy to see Byker just as a design achievement, but it is the social impact of change that is most important in making it qualify as a great neighbourhood. In Byker the key seems to be the method by which a liberated, empowered form of governance has been initiated and then sustained through the involvement of residents. As well as being members of BCT, residents are involved in monitoring its work and its contractors and are consulted on all the programmes and improvements on the estate. There are excellent communications between the Trust and residents, including a regular tenant-led award-winning newsletter and an easily navigable website. The BCT offices are in the centre of the estate and accessible to all residents. 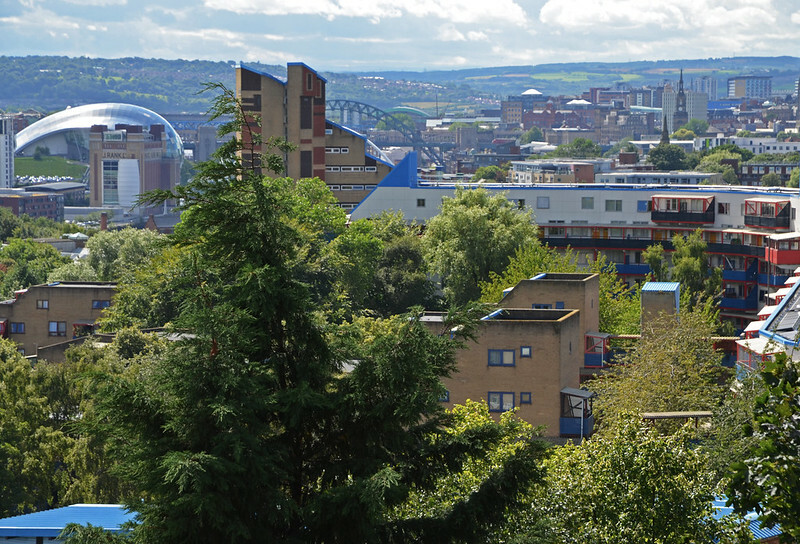 Byker is one of the most distinctive estates in Britain but it is also part of a greater neighbourhood that has leisure, retail and entertainment amenities. These include the area of Ouseburn (a shortlisted Neighbourhood in 2016) with its selection of cafes, restaurants, bars and hotels interspersed with galleries, museums, music studios and even a free city farm; Hoults Yard, a newly developed hub with an eclectic mixture of business, culture and leisure, easily accessible on foot from Byker and Shields Road, the main shopping street and home to a library, swimming pool, supermarket, post office, health centre, job centre, and a range of other retail and leisure amenities. Also nearby is Newcastle city centre, which can be accessed easily via a range of transport links, including the Metro, or on foot. Byker’s going green and as well as the photovoltaic panels on the Byker Wall, a biomass boiler uses woodchip as its fuel, and a combined heat and power unit contributes to fueling the district heating system thereby reducing the carbon footprint of the estate by moving to a green energy source that currently supplies 20 per cent of the output of the district heating system. The success of the use of biomass as a fuel source has led BCT to review how best to maximise the use of a low carbon fuel source to supply the district heating requirements and the installation of a 4 Mega Watt biomass boiler will be going out to tender in 2018. Homes are being fitted with improved controls, tenants are being educated on being energy efficient and the benefits have seen heating charges being frozen since 2012. The strong and inclusive management of Byker provides a number of learning points. In many respects the improvement of the estate is very similar to that of Golden Lane. However, Byker is virtually all social housing without the wealth and locational advantages of fellow Great Neighbourhood contender Golden Lane. It had become run-down but has been turned around by innovative management, therefore, we feel that it is the strongest candidate for the Great Neighbourhood award.